Deborah Stevens was born on August 20, 1958 in Elizabeth, New Jersey to Lorraine Stevens and the late great Willie Buster Stevens. She received her education in the Roselle Public School system in Roselle, New Jersey. Debbie dedicated a decade of her professional career at George’s One Hour Martinizing Cleaners in Roselle. She later joined Isfel Clothing Distributers in Rahway, New Jersey. Perhaps one of her most rewarding responsibilities, Debbie worked as a Security Officer at a number of elementary and high schools in Roselle. Even upon her departure from Roselle Public Schools, she frequently visited her school family; the Kindergarten students had a way of warming her heart and putting a smile on her face. Most recently, Debbie worked with New Jersey Turnpike Authority as a Toll Collector, sharing that infectious smile with every passing patron. Debbie was an independent single mother with indomitable strength who adored her boys. To know her was to understand a mother’s love for her sons, and in Debbie’s case, she had double the tenderness. She loved to attend Broadway shows, the movies, shopping and attending social gatherings with family and friends. She was best known for her practical jokes with a hearty laugh. It was just the right motivation to make your bad day seem perfect and turn strangers into old friends. Debbie was known to get down in the kitchen, and she shared a passion of baking with her sister, Cherel. On Monday, September 10, 2018, Debbie was called home to rest with our Lord and Savior Jesus Christ. 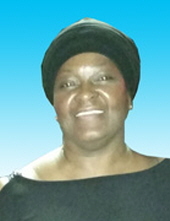 Debbie leaves to cherish her memory, her mother, Lorraine Stevens; loving sons: Wise Howard Franklin Fish and Ryan Justice Sherman Fish; two sisters: Tanyda Stevens of Roselle, New Jersey, and Sandra Grant of Brooklyn, New York; granddaughter, Alyssca Kimora Fish of Newark, New Jersey; nephew, Jayden Isias Camacho all of Roselle, New Jersey; goddaughter, Tiffany Sandlin of Rahway, New Jersey; loving aunt, Elizabeth Joe of Washington, District of Columbia; uncle, Calvin Stevens of Bishopville, South Carolina; and a host of dear relatives and friends. To send flowers or a remembrance gift to the family of Deborah Stevens, please visit our Tribute Store. "Email Address" would like to share the life celebration of Deborah Stevens. Click on the "link" to go to share a favorite memory or leave a condolence message for the family.